A Kabardian of Mount Caucasus in traditional folk dress. Home » A Kabardian of Mount Caucasus in traditional folk dress. 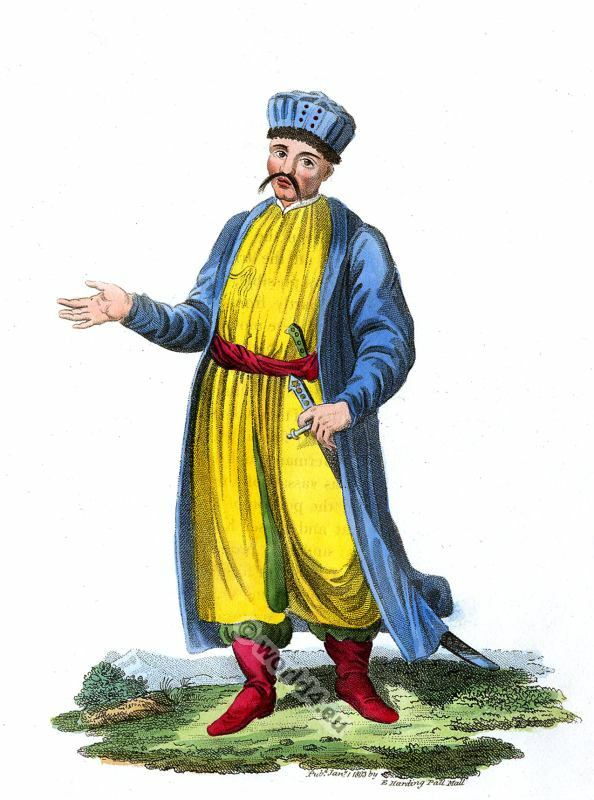 A Kabardian of Mount Caucasus. Un Kabardien du Mont Caucase. That warlike people, the Circassians, dwell chiefly in the mountains situated on this side of Caucasus, and extend as far as the beautiful plain which borders upon it, from which they have driven the ancient possessors, and taken possession of the greater part of it. These Circassians form a sort of knighthood, maintaining a system completely feudal between themselves and their vassals, similar to that which the German knights formerly introduced into Prussia and Livonia. Considered as vassals of the crown of Russia, by the last peace with the Ottoman Porte, the portion of territory belonging to that empire is distinguished into Great and Lesser Kabarda. The Kabardians trace their origin from the Arabs; and it is probable that they are the descendants of the armies sent, by the Caliphs of former times, towards the mountains of Caucasus. On the other hand, some writers suppose them to descend from the Mamelukes. The universal tradition, proving that they formerly inhabited the Crimea, is also confirmed, in this respect, by the de-nominations still existing. The upper part of the river Belbek in the Crimea is yet called Kabarda, in the same manner as the Tartars still give the appellation of Tscherkes-tus to the magnificent spot between that river and the Kastcha. The Circassians of Lesser Kabarda consider their frontiers as ex-tending from the right bank of the’Terek to the left of the Sunsha. This entry was posted in 1803, 19th Century, Asia, Caucasia, Russia, Traditional and tagged Edward Harding, Russian national costumes on 11/2/14 by world4.